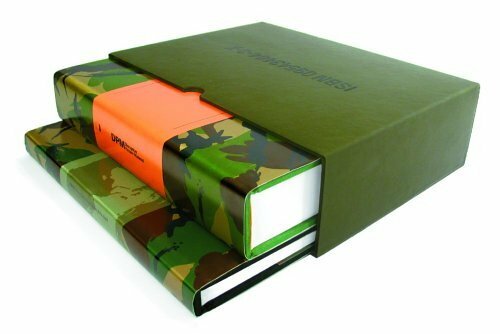 This encyclopedic art book charts the history of camouflage from its inspiration in nature, through its adoption by the military, to its current uses in design and popular culture. Divided into two books totaling 944 pages, DPM offers comprehensive coverage of this multifaceted and highly engaging subject. It contains more than 5,000 images by the world’s leading nature, military and fashion photographers. It includes a comprehensive guide to the camouflage patterns issued to soldiers of 107 nations around the world and documents the rise of camouflage outside the armed forces – its use by anti-war protestors in the 1960s, further exploration by modern artists, and reinvention within areas such as fashion, architecture, music, film and sport. Depictions of camo-clad cultural icons such as David Beckham, Robert De Niro, U2, Notorious B.I.G., Ali G, Neneh Cherry and Joe Strummer illustrate the theme. Rescuing camouflage from its unhappy associations with war and conflict, this book emphasizes its natural beauty. It is the modern reference guide for both the novice and the seasoned camoufleur. Text: Blechman Hardy, Newman Alex. cm 23×31,5; pp. 2 Vol; COL; hardcover with dust jacket. Publisher: DPM Ltd, London, 2004.